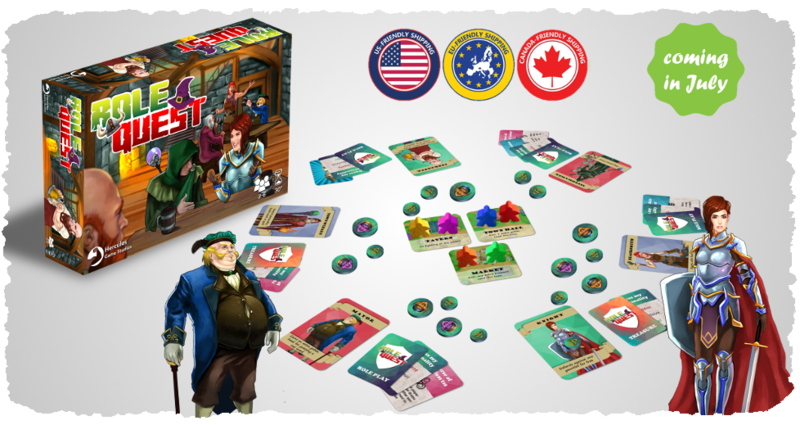 Role Quest is a social role playing game for three to six players that plays in around half an hour. 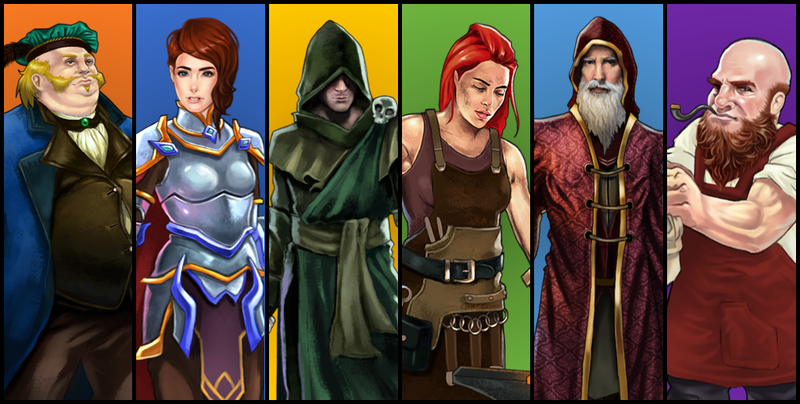 It sees players take on a role of one of six characters (Knight, Wizard, Innkeeper, Mayor, Necromancer, Blacksmith). They pair up and head to one of the available locations in the town (eg. the town hall or the tavern). Players are given a scene to play out by a player who is not at the same location. The game element to all this comes in from roleplay cards that give players a secret personality trait. They must work this trait into their performance of the scene. So, for example, the wizard goes to the tavern to buy a keg of ale from the innkeeper for a wizard meeting he is having. But the wizard is clumsy and the innkeeper is absent-minded. This scene is role played for sixty seconds after which each of the participants try to guess what the others personality was. Points (goblin heads) are then scored before moving on to the next pair. The game lasts for two rounds of everyone role playing a scene and whoever has the most gobbling heads wins. If Role Quest sounds like fun, that’s because it is. The role playing element is very light and silly. There is nothing like watching one of your friends trying to portray a forgetful wizard attempting to buy a cauldron. Role Quest also has a few tricks up its sleeve to keep things intersting. The game has six different locations characters can travel to, but only ever uses a maximum of three per game, which keeps the potential scenes fresh. The locations also contain various bonuses or powers that are activated by whoever visits them. This is a clever touch as it incentivises players to go to the locations for the bonuses rather than going to a location where their friend is. Extending the gameplay even further are Role Quest’s treasure cards. They consist of curse cards which are played as someone is about to role play their scene. It adds a complication they need to deal with. For example, the annoyed mayor must now play out his scene with a high-pitched voice. Whilst we found the curses added a new level of hilarity to the game, we felt it made trying to guess the personalities rather difficult. We also found that creating a house rule where the curses could only be played in round two made the game a fun experience for everyone. 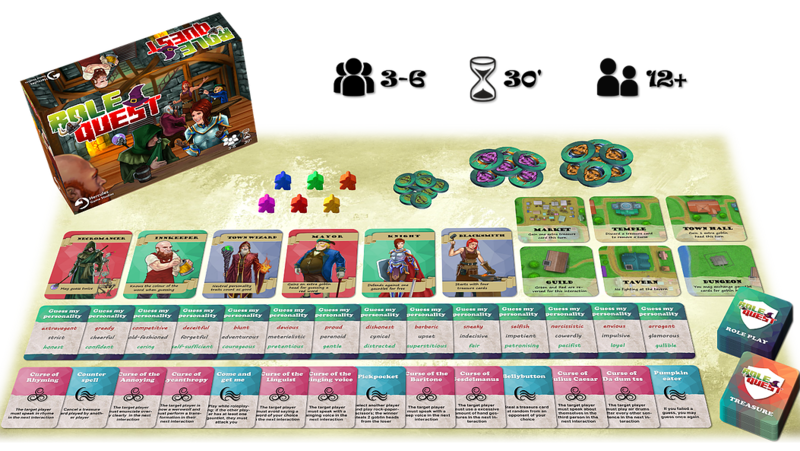 Role Quest’s rules are built in such a way that players can alter the game to suit themselves. Players are encouraged to alter the number of rounds for a longer game or increase the time for role playing to make things easier. This gives the sense that Hercules Game Studios care more about players having a fun experience than blindly sticking to a rigid rule set. Normally at this point in a review or preview we would point out any flaws or negative things we found in the game. There was one element of Role Quest that fitted the bill here. In the prototype we played there were certain cards that would allow you to steal victory points from each other. This did not fit in with the rest of the game and, after feedback from various playtesters, they were removed. Again, this speaks to Hercules Game Studio’s desire to make Role Quest a good time. Component wise, the version we played was a prototype. 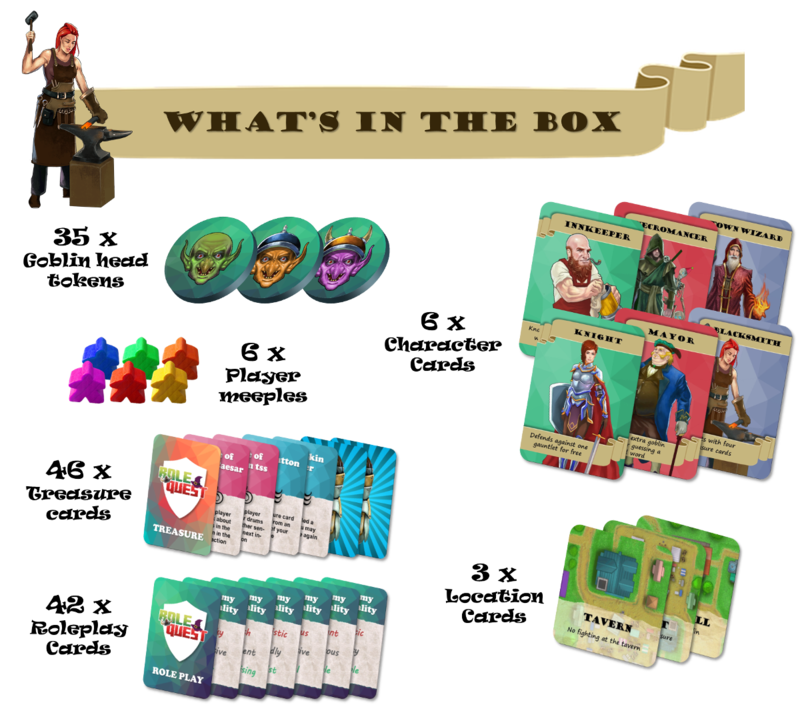 When we met with Hercules Games Studios at the UK Games Expo, they explained that the finished product will contain wooden meeples, thicker cards, improved graphic design and the point tokens will be cardboard punch outs. Overall we really enjoyed playing Role Quest. Although, we do feel that the game works better in a close group of friends rather than with people you don’t really know. 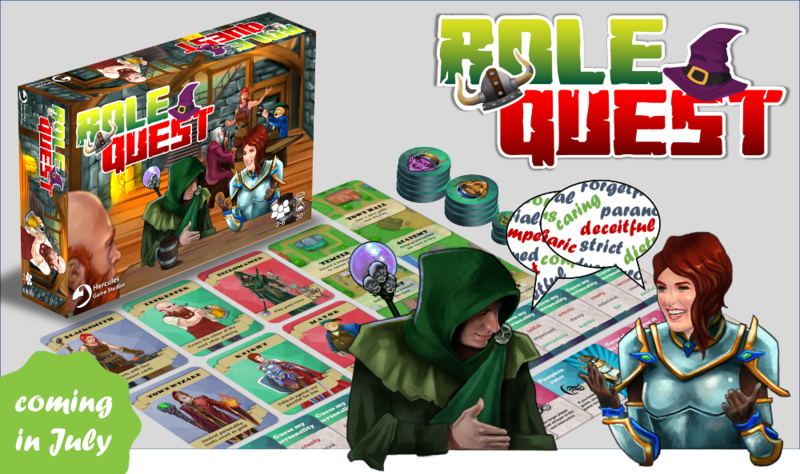 But when you play it in the right environment, Role Quest is a fast paced improvisation game that will provide you with twenty minutes of belly laughs.